Multiple Technologies for Solutions You Need! – Polytech Filtration Systems, Inc. Being environmentally conscious nowadays is crucial, and often a requirement for some of us in certain areas with regulation laws, and enticing tax break incentives to “Go Green”! 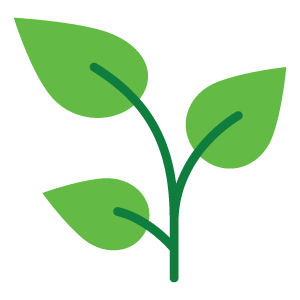 In light of last week’s Earth Day, here we are going to discuss Polytech’s multiple “Green Filtration” solutions! Our Whirlstream® Hydrocyclone, Conveyor Dragout, and Centrifuge systems provide a low-energy, yet effective filtration process to meet your application needs. Polytech’s Hydrocyclones offer: Centrifugal Separation of Heavy Granular Solids; Flow Rates of 20 GPM to over 1,000 GPM; High Separation Efficiency; No Filter media consumption, and are available with optional dragout conveyors for heavy solid removal. But how do they work you ask?! With Hydrocyclones, contaminated liquid enters the hydrocyclone at high velocity through the inlet opening. From there the liquid flows into the whirl chamber. As the liquid swirls downward in the conical separation chamber, its velocity increases. Solid contaminants are thrown against the walls, forced to the bottom, and discharged through a nozzle. As the whirling cleaned liquid approaches the bottom, it is unable to exit the restricted discharge nozzle. It then reverses direction, forms an inner vortex and seeks the clean liquid outlet. Due to their high flow rates of up to 1,000 GPM, high separation efficiency, and the fact that Hydrocyclones require no filter media, they are our personal favorite as an Eco-Friendly, Green Filtration solution! Learn more about Hydrocyclone for separation of of solids from machine tool coolant in our published Technical Article, here! On the other hand, our Centrifuge Systems provide excellent separation of very fine contaminants from water and low viscosity oil based coolants. They provide flow rates of 20 GPM, and help to minimize filter media consumption in cartridge or stacked disc filter systems for low micron or sub micron filtration applications. Centrifuge systems works best for applications having to do with: Surface Grinding (Fine: < 16 rms); End Mill Grinding; Abrasive Slicing; Honing, Lapping & Super-finishing; Vibratory Finishing; Glass & Ceramics, as well as Diamond & CBN Abrasive Machining. Additionally, Polytech’s Conveyor Dragout systems offer: Reliable, economical removal of contaminants which settle out rapidly without using any filter media; reduced maintenance commonly associated with settling tanks; double dragouts with extended dwell time for enhanced settling, and effective means of de-aerating and pre-filtering grinding oils. Because Conveyor Dragouts do not use any filter media, they are one of the most environmentally friendly options that we offer, however, they are not as effective time wise, or separation wise as the Whirlstream® Hydrocyclones. We have a variety of sizes and capacities to suit most applications. Conveyor Dragouts are best used in applications regarding: Both Rough (63 rms & above) and Medium (32-16 rms) Surface Grinding; Cutoff saws; Glass and ceramics; Broaching, hobbing, and trepanning; Gear hobbing; Boring and drilling; Chucking and milling, along with turning, lathes, and machining centers. Here, we are talking about the latter– the “greening” of manufacturing and filtration, where we are reducing pollution and waste (i.e. disposable filter paper media) by minimizing natural resource use. Without the use of (or reduced use of) filter media in our Hydrocyclones, Centrifuges, and Conveyor Dragouts, green filtration is attainable with recycling and reusing. If you are interested in learning more about Polytech’s Hydrocyclones, Conveyor Dragouts, or Centrifuge Systems, (or some of our other ‘non-green filtration systems’) please feel free to contact us, via our website, telephone, or email, filters@polytech-filtration.com, and one of our skilled and experienced engineers will guide you through choosing the best solution for your application needs! 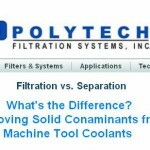 Welcome to Polytech Filtration’s first “official” Blog Post! Given that this week is National Engineers Week, we found it only fit to commemorate The National Society of Professional Engineers, and discuss the importance of engineers. More specifically, how the NSPE is using this week to spark interest in today’s youth and diverse groups so they can learn how they can make a difference. This year, National Engineers Week turns 65 years old! That means 65 years of celebrating how engineers make a difference in our world, increasing public dialogue about the need for engineers, and bringing engineering to life for kids, educators, and parents, and more! The NSPE holds EWeek annually not only to commemorate and thank the engineers that work so hard to make a difference in the world that we all live in, but also to encourage others to get involved. It is no secret that the engineering, industrial, and manufacturing industries have taken a hit in today’s economy, however, NSPE is trying to raise awareness on all the good that engineering can do, in order to rebuild the industry, especially with the ever changing technology world that we live in, e.g. Manufacturing 4.0. Incorporating newer generations into the future of engineering is crucial in order to stay updated, and diverse. There has been concern about the manufacturing talent shortage that some argue is seriously hindering industry growth. The Manufacturing Leadership Council stated in an article they recently posted, “One of the problems is that most of our machines are older than our new employees!”, which was pointed out by a senior participant at a recent Think Tank on Millennials during the 11th Manufacturing Leadership Summit this Summer in California. They also mentioned that the average age of an engineer in the United States is 55 years old, which is much older than in other countries such as Mexico and China, where the average ages are 27 and 24 years old, respectively. Because of this, many next-generation engineers in developed economies such as ours may face cultural and attitudinal age barriers in their companies that can very well undermine their sense of value, hinder their work, and even restrict their prospects for promotion. Check out that article here: http://bit.ly/1Ef5ka6 for more information and insight! It is important to emphasize the power that current, and next generation engineers hold to make a difference, and acknowledge how diverse and exciting the ever changing engineering world is. Advocating for younger individuals, and getting them involved is key, and NSPE is hitting all the right notes in terms of incorporating these issues into EWeek. Engineers Week is going on until February 27th, so make sure to check out bit.ly/1hhMiSt to stay updated on events and news… and don’t forget to thank an engineer this week for all that they do! Welcome to Polytech Filtration’s blog. Here you will learn about the latest Machine Tool filtration products and news that we have to offer!